This motel is 2 miles from Glendale Galleria Shopping Mall, and 5.4 miles from Rose Bowl Stadium. It features free Wi-Fi and rooms with 36-inch flat-screen TVs. A microwave and a mini-fridge are provided in every room at Glendale Motel. The simple rooms also include a clock radio. Hollywood and Universal Studios Hollywood are within an 18-minute drive from Motel Glendale. Griffith Park Observatory is 8 miles away. Make yourself at home in one of the 20 air-conditioned rooms featuring refrigerators and microwaves. 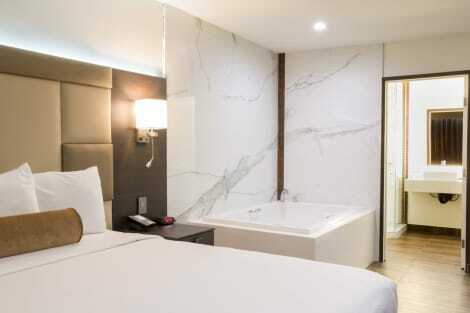 42-inch flat-screen televisions with cable programming provide entertainment, while complimentary wireless Internet access keeps you connected. Bathrooms have bathtubs or showers and complimentary toiletries. Conveniences include irons/ironing boards, and housekeeping is provided daily. Enjoy a satisfying meal at Pioneers Cafe serving guests of Days Inn by Wyndham Glendale Los Angeles. Quench your thirst with your favorite drink at the bar/lounge. Cooked-to-order breakfasts are available daily for a fee. 339 1/2 N Brand Blvd. Satisfy your appetite at Jax Bar and Grill, a restaurant which features a bar. Dining is also available at the coffee shop/café. Make yourself at home in one of the 87 air-conditioned rooms featuring kitchens with refrigerators and stovetops. 32-inch flat-screen televisions with cable programming provide entertainment, while complimentary wireless Internet access keeps you connected. Conveniences include phones, as well as desks and microwaves. Welcome to Hampton Inn & Suites Los Angeles - Glendale, a fresh and modern hotel near major offices, sports venues and Los Angeles-area attractions. Set in downtown Glendale, the hotel is steps from luxury shops, fine dining and entertainment at Americana at Brand and the Glendale Galleria. Enjoy easy access to I-5 and the 101 and 134 Freeways for quick movement around town – Warner Bros., Nestle USA, DreamWorks Pictures, AT&T and Cigna Healthcare are just a few corporations nearby. Our Glendale hotel is 20 minutes from Universal Studios and Hollywood, and Burbank Bob Hope Airport is just 9 miles away.Each stylish guest room has a microwave, mini-refrigerator, coffeemaker, HDTV and generous workspace. Connect your laptop to free WiFi, and stretch out on the clean and fresh Hampton bed®. Here a few days? Choose a studio suite with a living area, sofa sleeper and bar sink. Accessible rooms are also available.Start the morning right with Hampton’s free hot breakfast, including fresh-baked waffles, bacon, scrambled eggs and muffins. Our hotel offers an evening Manager’s Reception, and our Suite Shop® is open 24 hours for drinks or late-night cravings. Our friendly staff is happy to recommend Glendale-area restaurants.Relax after a long day with a swim in the outdoor pool, or re-energize with a workout in the 24-hour fitness center. Prepare for a meeting in the 24-hour business center with free printing services. The stylish, 19-storey Hilton Los Angeles North/Glendale & Executive Meeting Center is situated in an upscale business district. This North Los Angeles hotel in Glendale, CA is near Bob Hope Burbank Airport and only a few miles from LA area attractions. Ride the complimentary shuttle to and from the airport. Visit Los Angeles Zoo at Griffith Park, Universal Studios or shop at Glendale Galleria and Americana at Brand.Stay in a spacious guest room, suite or executive room at this Los Angeles North/Glendale hotel. 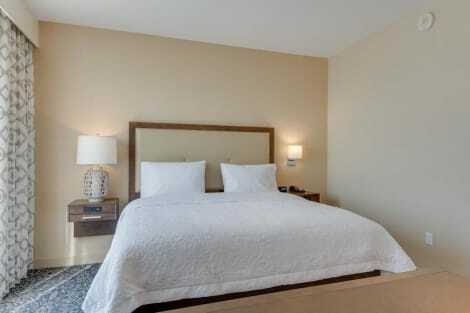 All rooms feature contemporary decor and high-speed internet access. Upgrade to an executive room on the higher floors for amazing views, exclusive amenities and complimentary breakfast for two at Trofi's restaurant.Centrally located and only a few minutes' drive to Burbank, Hollywood, Pasadena and Los Angeles, the hotel is Glendale's premier Executive Meeting Center. Take advantage of over 19,000 sq. ft. of meeting and event space, room for up to 850 people, for meetings, Glendale wedding receptions and special events.Catch up with work in the 24-hour business center, relax by the heated, outdoor swimming pool and whirlpool or work out in the 24-hour fitness center at our hotel in Glendale, CA. Indulge in an eclectic upscale dining experience at Porter's or, for a more casual affair, Trofi’s offers a variety of continental cuisine served in a relaxed atmosphere. Sip icy martinis in the contemporary rooftop Horizon’s Lounge, on the19th floor, and enjoy the 360-degree views of the spectacular Verdugo Mountains and downtown LA skyline. lastminute.com has a fantastic range of hotels in Glendale, with everything from cheap hotels to luxurious five star accommodation available. We like to live up to our last minute name so remember you can book any one of our excellent Glendale hotels up until midnight and stay the same night.